A term used for a group of eye diseases that involves high pressure in the eye, glaucoma can cause damage to the optic nerve and even lead to blindness if not effectively managed. As such, understanding the basics of the condition and knowing some characteristics to look for in the common types of glaucoma can help you avoid life-altering complications. There are several different varieties of glaucoma that affect nearly 80 million people worldwide. Nonetheless, most varieties are relatively treatable and have favorable outcomes if caught early. Also known as primary or chronic glaucoma, open-angle glaucoma is the most common type of glaucoma. This variation of the disease makes up at least 90 percent of all diagnosed glaucoma cases. It is known as “open-angle” because of the way that it presents. The angle at which the iris contacts the cornea is as open as it should be; however, the drainage canals become clog, reducing the rate at which the fluid in the eye (aqueous) drains. This clogging causes the increase in pressure that is characteristic of glaucoma. This form of the condition is generally slow developing and life-long. It can also be difficult to diagnose or catch because it typically develops slowly and has no noticeable symptoms. Nevertheless, primary glaucoma can be treated. The main goal of treatment is to minimize or reduce damage to the optic nerve and maintain eyesight. Depending on the severity of your condition, your doctor will suggest treatment via medication, laser therapy, or surgery. If the condition was caught early enough, your treatment will likely begin with a series of medicated eye drops to lower pressure; however, if this method is ineffective, you may have to explore other options. Keep in mind that many glaucoma medications do have side effects, so it is important to tell your doctor exactly what medication you are currently taking to avoid any complications. Often called acute glaucoma or narrow-angle glaucoma, angle-closure glaucoma is one of the less common types of glaucoma. Much like the name suggests, angle-closure glaucoma is called such because it is the result of the angle between the iris and cornea actually closing. It is also not uncommon for only one eye to be affected and for symptoms to dramatically worsen over a period of just a few hours. If you experience any of these symptoms, you should call an ophthalmologist immediately. While there is no medical cure for angle-closure glaucoma, there are treatments available that are effective. Your treatment options include either laser therapy or incisional therapy – one of which your ophthalmologist will likely suggest after considering your specific condition. You will also likely be given eye drops, oral medication, or intravenous medication to reduce the pressure in your eye prior to the chosen method of therapy. Also referred to as low-tension or normal tension glaucoma, normal tension glaucoma (NTG) is a condition in which damage occurs to the optic nerve even when eye pressure is not extremely elevated. The cause of this damage is still largely unknown, which makes this form of the disease a little more perplexing than other forms of the disease. Even so, with what is known about the disease, including key risk factors, some steps can be taken to treat the condition. Individuals with a family history of the disease. People who have Japanese ancestry. Individuals with a history of heart disease, such as irregular heart rhythm. Normal-tension glaucoma is typically diagnosed with careful observation of the optic nerve. Your doctor may use a procedure that involves looking at the nerve through an ophthalmoscope to see if the nerve is cupped or discolored. Likewise, your doctor will perform a vision screening to identify any areas of vision loss. Because the condition is still somewhat illusive to doctors, most care providers treat this condition by lowering the eye pressure as much as possible. This reduction in pressure is usually achieved using medication, laser therapy, and/or surgery. Congenital glaucoma is one of the rarest types of glaucoma that presents in babies. The condition occurs when the baby’s eye drainage canals do not form completely or correctly in utero. Believed to be an inherited condition, congenital or childhood glaucoma often causes enlarged eyes, cloudy corneas, and light sensitivity in addition to the increased pressure in the eyes. In many cases, surgery can be performed to correct the structural defects that caused the condition. However, some cases may require medication and surgery. The two primary types of surgery are filtering and laser surgery. Filtering surgery uses small surgical tools to create a drainage canal for the eye, while laser surgery uses a small, powerful light to create a small opening in the tissue of the eye. Medication typically involves a combination of eye drops as well as oral medication. These treatments are aimed at lowering the pressure in the eye either by decreasing the fluid production in the eye or increasing the fluid draining from the eye. Although glaucoma can cause significant eye damage if left untreated, many of the types of glaucoma can be well-managed if caught early on. 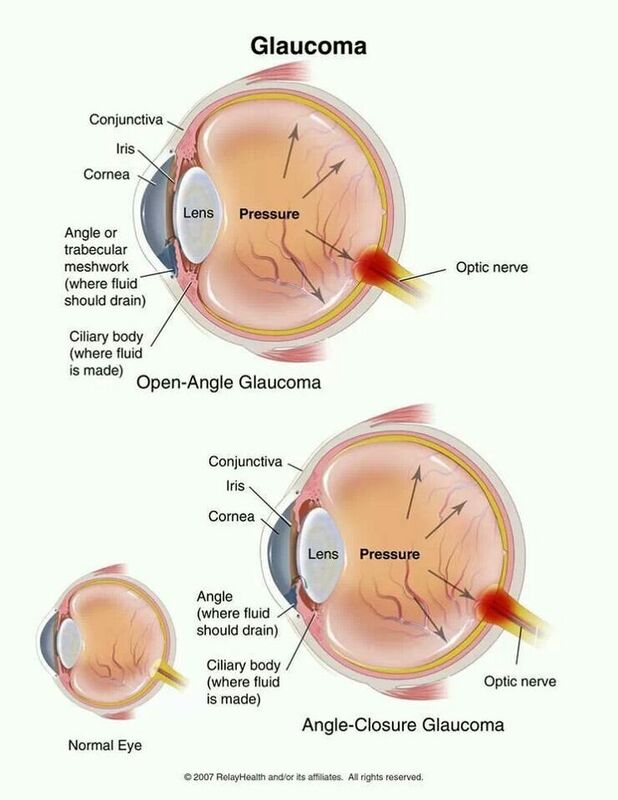 Open-angle glaucoma and angle-closure glaucoma are the most prevalent types of the condition, but normal-tension and congenital glaucoma are common enough that it helps to be aware of them. Should you think you or someone you love is dealing with an eye pressure issue, seeing the doctor sooner rather than later can prevent life-altering complications.